At the Change of Command Ceremony of Combined Task Force 151 (CTF151), held at the Naval Support Activity, Bahrain on 7 March 2013, Commodore Muhammad Hisham Pakistan Navy handed over Command to Rear Admiral Giam Hock Koon of the Republic of Singapore Navy. 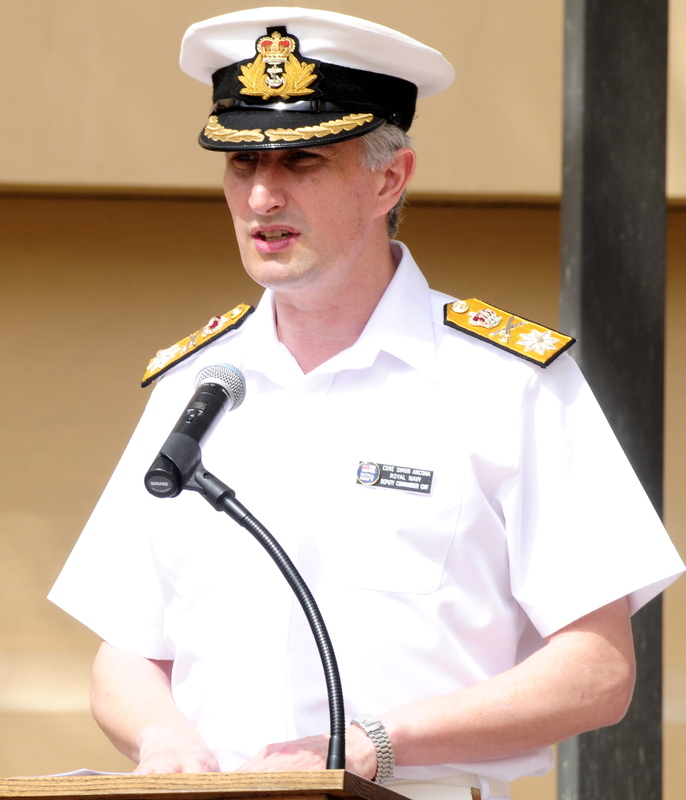 During his speech, Commodore Simon Ancona Royal Navy, Deputy Commander Combined Maritime Forces took the opportunity to bring clarity to the current status of piracy in the Horn of Africa. “As the Deputy Commander of the Combined Maritime Force I would like to acknowledge immediately that the recent unrelenting efforts of every member of CTF 151 have contributed to regional success in winning the ongoing battle against piracy on the high seas. There is little doubt this has been a highly successful command period for Commodore Hisham and his staff. I believe this to have been achieved on three levels. The first is in the mechanics. Cdre Hisham and his team spent 73 days of their 83-day command onboard the USS FARRAGUT. Commanding from a non-specific or dedicated command platform can present a challenge to some, but through their professionalism openness and effective communication CTF 151 operated efficiently alongside the crew of the FARRAGUT and liaised perfectly with CMF HQ. At times I felt they were hundreds of yards away rather than hundreds of miles in the middle of the Arabian Sea. A seamless transition ashore proved the capacity and versatility of a strongly led and hugely capable staff. The second level was in tactical execution. In a perfect world success is easy, but it is in overcoming the grit, friction and inertia of reality – where each step forward is hard fought – where the true measure of success lies. Cdre Hisham and his team can claim they were subject to these difficulties but accepted and overcame them. He optimised assets, cooperated with others and focused efforts to maximum effect to maintain our understanding of the piracy problem and assist in the vital pressure that has been an essential part of our recent collective success. The third and arguably the most important is more to do with Chemistry. Not easily measured by traditional means, it is less tangible and has to do with personality, leadership, approach, style and relationships. I have been grateful for the calm wisdom and warm approach of Commodore Hisham. These traits have made his key leadership engagement such a success. His quiet influence has been strong. He and his staff were energised from the very beginning and determined to make a difference: – enthusiastic but measured, versatile but focussed; proactive not reactive and never lost sight of the fact (that many have missed) all the ingredients of the piracy problem still exist the prey still flows through the Bab–el-Mandeb along the Gulf of Aden and across the Arabian sea -and some of it seems less inclined to protect itself. The young men of Somalia remain poor – open to persuasion, the financiers remain watchful for opportunity and profits, which still flow from legacy ransoms, and the security on the ground in Somalia, despite political and military successes is unlikely improve in a material way for the foreseeable future.